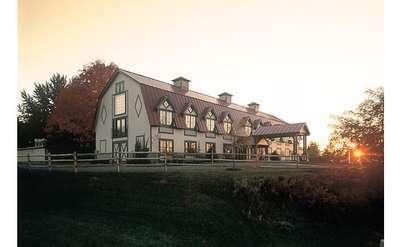 If you’re planning a wedding in the Saratoga region, chances are you will be checking out hotels and resorts that accommodate receptions, along with other types of Saratoga wedding venues. When reviewing options, while it may seem obvious, make sure to keep in mind the the number of people on your guest list, as well as the reception’s overall flow based on activities. An empty room can look huge, but a band or DJ setup, buffet, bar, tables, chairs and other wedding essentials can fill up the space quickly. Hotels and resorts can typically accommodate parties that range in size from 50 to 500. As an added bonus, many have event planners specializing in wedding receptions right on site! Let the Holiday Inn at Saratoga plan your perfect Saratoga wedding and reception. We can accommodate every need, from cocktail receptions to full dinner menus. Max capacity up to 600 guests. Plan your Saratoga wedding in a setting reminiscent of the days of the Great and Gracious. Nestled within the serenity of Saratoga Spa State Park, The Gideon Putnam provides an ideal setting for your special day. Combining the perfect balance of historic charm and modern luxury The Gideon Putnam helps make your wedding unforgettable. The Saratoga Hilton's wedding venue services include a personal wedding manager who will work closely with you to ensure your wedding is exactly as you have dreamed it, right down to the smallest detail.